Lights, camera, action! This week in Montgomery County features plenty of festive lights and phenomenal concerts and plays. Plus, get in the holiday spirit with a guided walking tour (even go by train or tram!) at one of many cheer-filled attractions. 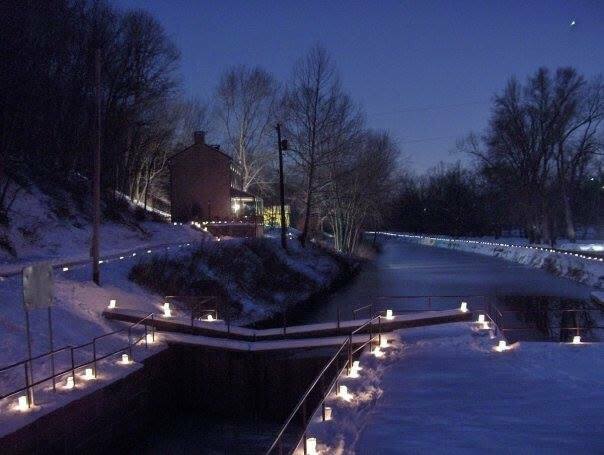 See the paths of Schuylkill Canal Park lit up by the glow of candles on December 9. This festive night at Lock 60 at Schuylkill Canal Park includes music and cider, and Santa. Renowned Philadelphia-based cinematographer and inventor Garrett Brown will visit Bryn Mawr Film Institute on Wednesday, December 6 for an educational and entertaining evening where he will discuss his innovations, show clips and examples from projects old and new, and answer questions from the audience. Local Funny Man Buddy Harris brings three comedians to the Underground: Marc Staudenmaier, Eric Roth and Mary Radzinski. Join us for a night of Nashville fun in The Water Tower, featuring artists: Rachele Lynae & Emily Jubb. The Music City residents are taking a trip up to PA for one night of country fun! Performing songs of The Band, The Weight Band is keeping the spirit and the music alive that helped define an era. Hear the most authentic presentation of The Band&apos;s music performed on stage, and see why the Chicago Sun Times proclaimed "The Weight carries on where The Band left off." Come and take a load off. Holiday shopping at Abington Art Center with original works from over 26 artists featuring jewelry, ceramics, textiles and photography. Join us for a morning of holiday shopping hosted by the Young Friends and cross all the gifts off your list. The Neiman Marcus "Love to Give" Collection features more than fifty treasures perfectly priced for giving. 10% of your purchase from the Holiday Shop benefits the Philadelphia Museum of Art&apos;s educational efforts—bringing elementary school classes to the Museum with enriching programming. The Washington Memorial Chapel and The Washington Memorial Heritage are joining forces with the Valley Forge Park Alliance to host a special evening with Lawrence Babits, professor of Maritime Archaeology & History, East Carolina University. As part of the monthly Speaker Series, which is held at The Washington Memorial Chapel, Babits will offer his unique insight into how battles were fought during America’s War for Independence. Meet Santa while enjoying fresh baked cookies and hot chocolate. The magical evening culminates with an exhilarating countdown of the lighting of the Christmas tree! Join Chef Chiwishi Joy Abney in the kitchen to mingle and make festive holiday appetizers. Fun, flavorful and easy to duplicate again and again for your holiday entertaining. This class is for adults--and don&apos;t forget to BYOB! Enjoy a festive, scrumptious breakfast with Santa and Mrs. Claus. Breakfast, a photo opportunity with Santa and Mrs. Claus, a visit to the Train Room and more are included! Do you know the difference between reindeer, caribou, elk, and our local white-tailed deer? Find out about reindeer and other animals of the far north. Hear a story, play reindeer games, and make a reindeer craft. Peter Wentz Farmstead&apos;s Child Play Series features history geared specifically for preschoolers. In this program, kids will learn about holiday traditions and make a take-home holiday craft. Decorate a homemade, pre-constructed gingerbread house while enjoying light refreshments. These special evening trains bring the storybook magic of the season to life! Join us in your pajamas and sip complimentary hot cocoa as we read &apos;Twas the Night Before Christmas. Enjoy Christmas music and the comfort of our Edwardian-era cars as the holiday lights of the Secret Valley roll past your window. Rumor has it Santa himself may appear with a gift for every child. The Heckler Plains Folklife Society invites you to enjoy an old-fashioned Christmas celebration by caroling around a bonfire beginning at 7 PM. When the caroling ends, guests are invited into the candle-lit farmhouse for hot cider, hot chocolate and homemade treats. See Hope Lodge in all of its seasonal brilliance on December 9. Guided holiday tours will be offered at 10 and 11:30 a.m. Holiday cookies and cider are included with admission. Celebrate the holiday season at the American Treasure Tour! Experience your favorite Christmas hits on our wonderful nickelodeons and band organs while taking a tram ride through our giant Toy Box. Morris Arboretum’s popular Holiday Garden Railway, one of the Arboretum’s most beloved holiday traditions, returns. The buildings and trains are all meticulously decorated for the holidays with lights that twinkle along the tracks and around the surrounding landscape. Santa will visit with guests throughout the holiday season at his house on West Main and Madison Street across from Railroad Plaza. Don&apos;t forget your camera!